As for package - xscreensaver may not be culprit. I booted today's daily image on different box which has two displays; at first it was good (displays next to each other horizontally). I adjusted position so they were vertically placed (like they are for that box, and this reporting box the bug-report relates to). I could re-create bug by using 'monitor settings' to a vertical placement & letting screensaver run. When the screensaver takes effect, both displays go dim & go black for maybe a second then one shows screensaver, the other returns to normal display. If i have windows (hexchat, htop/glances running) on the non-screensaver displaying window, those contents continue to receive updates allowing me to see new incoming messages in hexchat, or view the process info in htop/glances on a qterminal window. as screensaver takes effect, both will dim, then one will display screensaver, other will return to displaying the window it was before with information (htop etc) updating as if unlocked. 2019-04-11 - This is not a Lubuntu only issue. I recently installed opensuse tumbleweed over a sick leap install on my hp 8200 elite sff (i5-2400, 8gb, nvidia quadro 600) box - and it exhibits the identical behavior when using LXQt. on this box I normally don't have LOCKED SCREEN enabled, but I get the same result if that box is ticked or not. I tried changing screensaver & it made no difference (my default was random anyway), and the issue only occurs in Lubuntu (not Xubuntu) so it's likely a different package or config at fault so sorry. logged out & re-tried, still same effect (I can view one screen which updates its windows [htop] and screensaver runs on other). <krytarik> guiverc: Okay. Try and reproduce this on a Lubuntu 18.04 Live medium to perhaps exclude LXQt being a factor. <guiverc> krytarik, does arch matter? (my box is x86_64, have found lubuntu 18.04 i686 thumb-drive) will that do? <guiverc> or should i keep looking (or write a x86_64)? <krytarik> No, can't imagine it does. both screens dimmed, and then screensaver ran on both displays (different colors & patterns on each). stopped it, waited again & same result (both screens hidden by screensaver with different patterns & colors used on each monitor's screensaver image). this is expected behavior. again it worked perfectly, different pattern & colors on each display. <krytarik> guiverc: Okay, thanks. Then it seems like the correct package to file the bug report against is somewhere in the LXQt space. <krytarik> guiverc: Try and "killall lxqt-powermanagement" and see if it's still the same then? <krytarik> Otherwise, only lxqt-session comes to mind as a possible culprit. the effect was no different. On my lubuntu 19.04 installed system (no reboots since yesterday) screens dim, then one screen has screensaver & other is restored to qterm+hexchat which update normally fully visible. I just booted a 19.04 daily image used in my last Lubuntu x86_64 QA-test [booted on hp 8200 elite sff (i5-2400, 8gb, nvidia quadro 600)]. 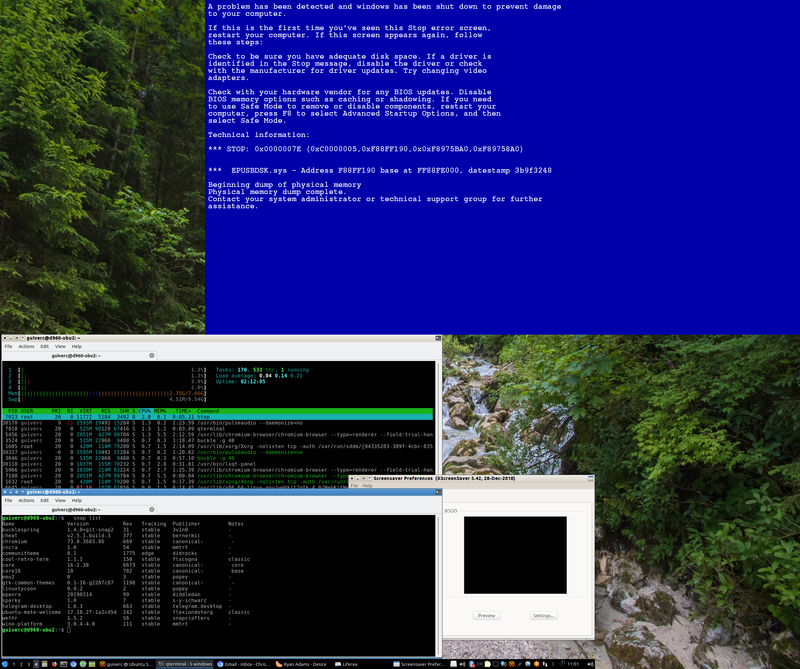 The daily.ISO was downloaded 29-Jan with ISO dated 28-Jan, and xscreensaver had no issues with two screens (both showed different color & different images & no htop's visible). I've re-powered up my file server so updating my daily & plan to re-test with todays. <krytarik> guiverc: As per your comment 7 on LP bug 1814490, did you test the other desktop environments also with the vertical positioning of your displays, or could you do so now? <krytarik> guiverc: Okay. And if you test it on Lubuntu 18.04 too, that would be great. <lubot> <HMollerCl> I want to change the default icons for papirus (not dark) which branch should I arc with? <krytarik> guiverc: Okay. Wanna go add lxqt-session as another affected package to the bug report then? Otherwise, it'll probably never get looked at, as the numerous other xscreensaver bug reports. // following are selected portions copied/pasted from QA-test report. i adjusted monitor-settings back to left-right configuraton (as it was when booted) & re-did some of the above bug-report tests, the screensaver did not correct itself, with 2nd monitor unhidden & vlc counter continued counting up as played mp3, & muted firefox kept streaming abc news 24 (au news).. both monitors are dimming before screensaver draws, then bottom/right monitor resumed to display of firefox streaming news & part of vlc visible showing time-position of mp3... i've restarted screensaver-daemon & waiting... restart made no difference. logging out & back in.. (monitors left-right arrangement as like when booted, but changed a 2(+) times... this time both screens are covered by screensaver!!! drag VLC so it's full onscreen (only left part was visible - ignoring this)..
i changed display orientation back to what it booted as (DVI0 on left, DVI1 just to right) and all maximize, minimize, menu showing & usable, etc issues were solved... it relates only to monitor.position and most people will have left-right I bet. (screensaver bug https://bugs.launchpad.net/ubuntu/+source/lubuntu-meta/+bug/1807665 was unaltered! it still shows htop running dvi0 & htop running perfectly visible dvi1 but I've covered this in prior QA-test report. I restarted screensaver deamon (even changed from m6502 to another) & dvi0 is hidden, dvi1 perfectly visible.